Powers: Detonator could cause his body to explode simply by being struck by kinetic energy. The strength of the strike decided the magnitude of explosion. 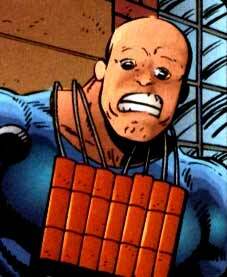 NOTE: The Detonator created by Erik Larsen, with help from Keith Giffen and Victor Bridges. The Detonator was one of the numerous cast-offs created from Johnny Redbeard whose interest in his creations was notoriously limited. Being unable to cope with his unstable powers and the rejection, Detonator was willing to leap to his death from a skyscraper as the impact would have caused him to destroy all of Chicago. Freak Force intervened and managed to capture him before he could make good on his threat. Many years later, the Detonator was one of the aging freaks that OverLord III recruited for his Dragon Army. These rejuvenated villains were dispatched to kill Dragon but unfortunately for them, Dragon had transformed back into his original Emperor Kurr persona. He was disgusted that humans had injected his blood into their bodies and proceeded to exterminate these thieves.